Gabriel Campanario will give an illustrated talk about drawing the urban environment and his new book, "The Art of Urban Sketching: Drawing on Location Around the World," from 1 p.m. to 3 p.m. Sunday, April 29 at The Seattle Public Library, Central Library, 1000 Fourth Ave., Level 1, Microsoft Auditorium. The program is free and open to the public. No registration is required. Parking is available in the Central Library garage for $6 on weekends. 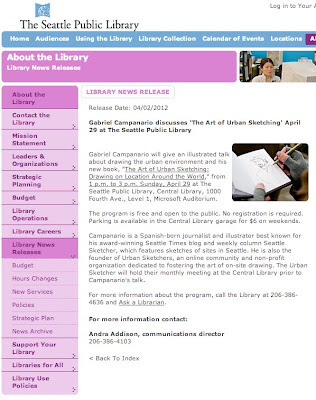 Campanario is a Spanish-born journalist and illustrator best known for his award-winning Seattle Times blog and weekly column Seattle Sketcher, which features sketches of sites in Seattle. He is also the founder of Urban Sketchers, an online community and non-profit organization dedicated to fostering the art of on-site drawing. 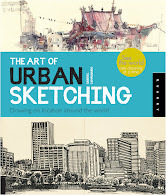 The Urban Sketcher will hold their monthly meeting at the Central Library prior to Campanario's talk. For more information about the program, call the Library at 206-386-4636 and Ask a Librarian.